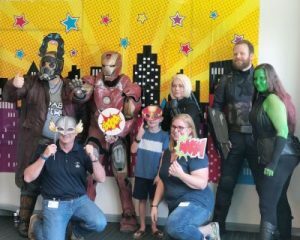 On Friday, July 13, superheroes descended on the AMSURG headquarters in honor of a very special child. Make-A-Wish of Middle Tennessee teamed up with AMSURG to treat 7-year-old Gabe to a morning filled with all his favorite things and to make his special wish – taking a cruise with his mother, father and sister – come true. Gabe has congenital heart disease, a condition that was diagnosed when his mother was pregnant with him. He has undergone two open heart surgeries, with the first procedure performed when he was a mere five days old. In total, he has bravely faced five surgeries. Despite everything Gabe has endured, his aunt said that he always has a smile on his face. The celebration allowed him to do just that. During the event, Gabe feasted on his favorite food – corndogs – along with an assortment of snacks. He also posed for photos with superheroes such as Iron Man and Black Widow. Superhero decorations adorned the walls throughout the space while football-themed games kept him entertained. Gabe and his family began their Disney cruise to Castaway Cay in the Bahamas July 15, just two days after the celebration. When asked what he was most looking forward to about the cruise, he said the waterslides He was also excited about how large their room would be. It was a privilege to partner with Make-A-Wish to bring some much-needed happiness to a young child whose life has been filled with so much adversity and hardship. We hope Gabe and his family will make lifelong memories on their cruise and that those memories will help carry them through future challenges.